For those of us following the US position regarding the International Code and baby food marketing, its worth looking back at his record here as well. Here is an article from 2005 about his efforts to oppose the International Code of Marketing of Breastmilk Substitutes in the early 1980s. 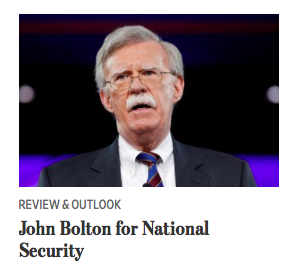 WASHINGTON … Democrats in Congress released a letter from a woman saying she was verbally abused by Bolton more than 20 years ago … Lynne Finney, a former legal adviser to the U.S. Agency … wrote that Bolton “screamed that I was fired” when she refused to lobby for a weakening of restrictions on the sale of infant formula in the developing world. … the incident took place in late 1982 or early 1983, when Bolton, as the top lawyer at USAID, outranked Finney. Finney said she refused, citing studies showing that use of formula was killing babies in the developing world because it was overly diluted or mixed with dirty water.